Team Yoshimura Suzuki Racing could not have scripted a sweeter start to the 2012 AMA Pro Motocross season if they’d tried. Returning to the motocross series for the first time since 2008, new Yoshimura Suzuki rider James Stewart raced his RM-Z450 to victory in both 450 motos to take the overall win in round one at the Hangtown National in Sacramento, CA, on Saturday afternoon. Yoshimura Suzuki’s Brett Metcalfe was right there with his new teammate, putting together two solid motos to finish the day in a very respectable fifth-place overall. In his inaugural race on the Yoshimura Suzuki RM-Z450, Stewart was nothing short of flawless. The first moto saw him get a great start and take the lead on the first lap. From there, Stewart slowly but surely created a gap and led all laps to take the win. In the second moto, Stewart got shuffled around a bit on the start but quickly made short shrift of the competition. Taking the lead, Stewart rode a calculated, efficient race, and again gapped the field while remaining in his comfort zone. Anything but victory was simply out of the question. Likewise, Australian Metcalfe turned in a promising performance in both motos. In the first one, Metcalfe got a good start on the Yoshimura Suzuki RM-Z450 and worked his way up to second before fatigue set in and he finished fourth. In the second moto, Metcalfe again ran in a podium position before finishing fifth. At the end of the day, the Yoshimura Suzuki rider was happy to finish fifth overall. Metcalfe is in a three-way tie for third in championship points. As the Yoshimura Suzuki squad prepares for round two next weekend, both Stewart and Metcalfe are enthusiastic about the race in Texas. Stewart is particularly excited about the upcoming event because he’ll be contesting it as the series points leader and, as a result, will run the leader’s red number plate. 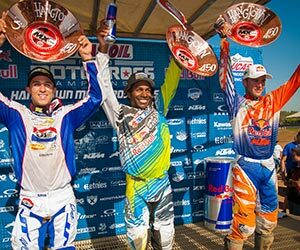 Red Bull/KTM Factory riders Ryan Dungey and Ken Roczen opened their outdoor season with flair at the Hangtown Motocross Classic on Saturday. 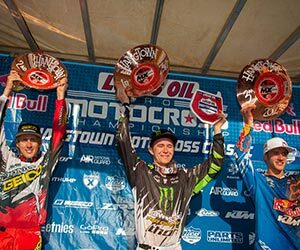 Dungey finished second in the 450 class and Roczen scored a podium third in the 250 class. Dungey missed the start in the opening moto and was back at twelfth at the step-up jump to advance two places at the close of the first lap. He then settled down to pick off riders one by one until he was fourth at the half way mark He put a pass on Andrew Short to takeover the 4th place spot and soon began to reel in Brett Metcalfe. With four laps to go, he moved up to third and held the position right to the flag. Ryan was much more efficient as the gate dropped for the second moto and was second at the first corner. He and James Stewart then pulled away from the group and began to battle it out for the premier place. He managed to stay with Stewart, narrowing the gap to less than a second but then encountered some back markers in the last three laps, which then put him out of contention for the win. His 3-2 results earned him 2nd overall for the day. Ryan Dungey: “I really enjoyed racing here today. I had some good luck and some bad luck but I’m glad to be on the podium and finish safely. I feel like my fitness was there today and I just need to get up front and out of traffic earlier to get my KTM up front. I am looking forward to the next round at Freestone Raceway. Earlier in the day Dungey’s factory teammate, the German teenager Ken Roczen opened his account for the season in the 250 class by snatching the holeshot in the first moto from Justin Barcia. The two swapped positions at the fourth corner and but Roczen kept Barca in his line of vision. Roczen grabbed the lead back in the next lap as Blake Baggett caught the leaders and joined the battle for the number one spot. Roczen held the lead but Baggett made his move in the last corners and Roczen had to settle for second. Roczen’s 250 Class teammate and French rider Marvin Musquin also put in a strong ride for fifth in the opening moto considering he was competing with a yet to heal fracture in his hand. Musquin and Roczen both got away cleanly in the second 250 class moto with Musquin at third and Roczen in fourth. They swapped positions in the next lap and Roczen doggedly held on to that spot to the flag. His 2-3 finishes earned him 3rd overall for the day. Musquin rode inside the top five for the first part of the moto but dropped below 15th after his hand began to bother him at the halfway point. He was able to recoup on the closing laps and advances to fourteenth to come away with a creditable ninth overall for the day, despite his injured hand.